When I first saw this mirror DIY, I knew we had to make it for our master bedroom. We have a subtle nautical look in the bedroom (no boats or lighthouses, thank you very much). 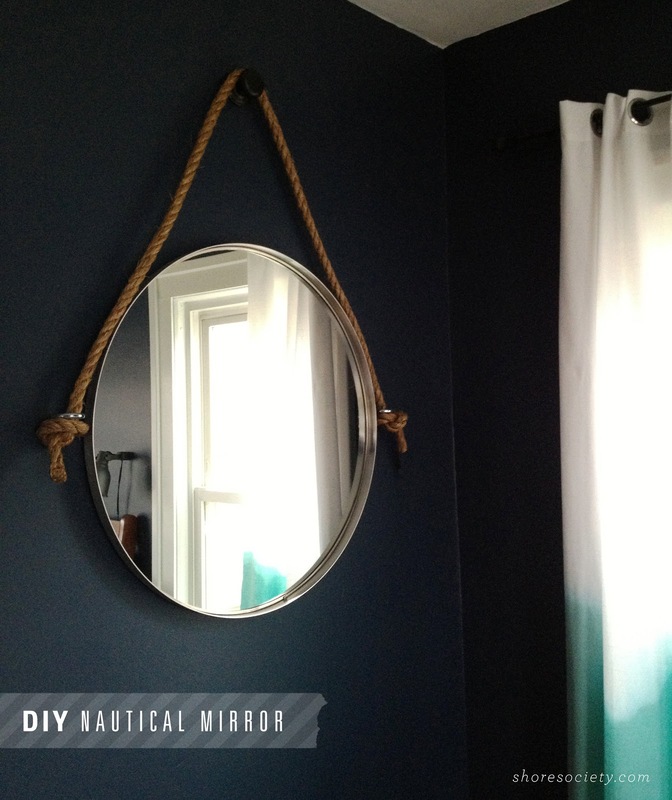 It was an IKEA hack inspired by a Restoration Hardware mirror, and cost us under $50 to make. Win! The interesting thing about this mirror (and the original Restoration Hardware one) is that it doesn't actually hang on the rope. There's no tension there. So, you will start by hanging the mirror on the wall as you normally would - leaving room for the rope and doorknob fixture at the top. After you hang the mirror, screw the eyelets into the wall. You can measure up from the floor to make sure they're even on both sides. You will probably need to drill some starter holes in the wall since the eyelets are pretty thick. Now, you'll attach the doorknob to the wall with screws (there should be holes on the plate of the doorknob). You can mount it as high as you'd like - I believe ours was about a foot and a half above the top of the mirror. Finally, thread the rope through one of the eyelets and finish it with a stop-knot. Loop it up over the knob, and down through the next eyelet, tying with another knot. Trim the ends of the rope and loop some fishing wire around the ends to stop the rope from unraveling. And that's it! It was an easy DIY that added something really unique to our room. Mirrors can be expensive, so I'm really happy we were able to make something budget-friendly that ended up being better than anything we could have bought!